Donor support is helping us raise the next generation of journalists by making engaged learning experiences accessible to individuals from all backgrounds. 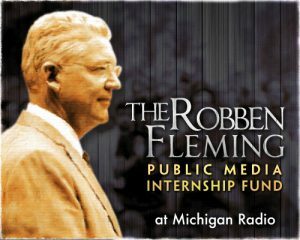 Named for Robben Fleming, who served as president of the University of Michigan from 1968 to 1978, the internship honors his contributions to keeping free speech alive on campus during the turbulent 60’s and 70’s, and is preparing the next generation of journalists. All gifts to the fund are being matched one-to-one. Meet our current and featured former interns. The state of professional journalism is arguably at its weakest point. Newspapers are struggling with significant downsizing, decreases in publications, and bankruptcy, while the boom of digital information platforms has enabled anyone with an online blog to call him or herself a journalist. This new reality has led to fewer opportunities for tomorrow’s journalists struggling to find a path forward. Presently there are few opportunities for students to learn the necessary skills to become journalists. Often in response to limited employment prospects, some universities have chosen to eliminate journalism programs altogether. As a consequence, the most common option for an individual contemplating a career in journalism is to work at student or local newspapers – and only then in a limited capacity. The next generation that will take the reins of journalism in a few years needs a pathway to preserving this critical part of our democracy. They need training that acknowledges the awesome responsibility that our free press plays in our world, and they need preparation that includes exposure to models of integrity, credibility, and trust. Those needs are addressed through internships. At the same time, we need to remember that public radio’s audience is remarkably more diverse than popular stereotypes indicate, and we need to ensure diversity in the voices of public radio tomorrow so that we are prepared to tell all the stories of our community. In order to better serve our increasingly pluralistic audience, Michigan Radio wants to ensure that the next generation of journalists better reflects the state’s people in terms of heritage, culture, ethnicity, and life experiences. Our internships offer the opportunity for public radio to begin addressing issues today while also providing engaged learning experiences. Paulette Parker works in the newsroom. AFFORDABILITY: Paid internships relieve some of a students’ need to take out loans for their education by providing them with assignments that help offset their cost of living. Your financial support ensures that intern candidates from all socioeconomic backgrounds have the opportunity to do meaningful work. EXPERIENCE: We believe that university students should have access to life-changing educational experiences, and these internships provide real-world training and invaluable opportunities to begin a career. DIVERSITY: The next generation of journalists will come from a wide range of America’s cultures and bring new perspectives to an industry that has historically not been very diverse. Student interns will encounter new situations working with people very different from themselves. ENGAGED LEARNING: An education should go beyond the four walls of the classroom. Your support brings talented and eager students together outside of the classroom, to a field where they will apply their knowledge of the humanities, the arts, science and technology. Contact Larry Jonas at ljonas@umich.edu or (734) 764-9210 to arrange a visit. Meet our interns, hear their stories, and discover how your gift can help transform a student’s college experience into a meaningful career. Make a contribution to the Michigan Radio Internship Fund.